The Radial Filefish, Acreichthys radiatus, seldom seen in the aquarium trade, is now becoming available as a captive-bred, reef-save choice being produced by ORA in Ft. Pierce, Florida. Image: Renee Hunter/ORA. 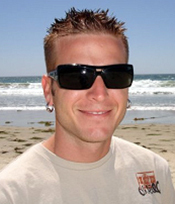 Dustin Dorton, ORA chief operating officer. These fish can also rapidly change their color pattern from starkly striped to camouflaged blotches, depending on their mood or environment. The overall appearance may be a shade of brown or tan, cream, green, or even blue. 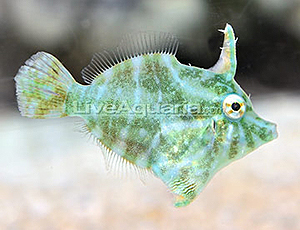 Able to change colors in a flash, the Radial Filefish can appear brown, green, blue or cream and with variable markings. Image: Copyright © LiveAquaria.com/Kevin Kohen. The Radial Filefish reaches a maximum length of 3 inches (7.6 cm) and is a personable aquarium inhabitant with curious, rotating eyes that follow activity outside the aquarium, eager to eat whatever frozen or prepared food is dropped in from above. ORA says it feeds its broodstock and juveniles a wide range of diets including pellets, frozen Mysis shrimp, and brine shrimp. They are ranked as hardy and appropriate for keeping by beginners to experts. Singularly or in pairs, they can be kept in nano aquariums in the 20 to 30-gallon size range. Larger aquariums can house multiples, and groups can even contain multiple males. Sexing individuals is relatively easy due to a sexual dimorphism, where the males exhibit bushy spines at the base of their caudal peduncle, similar to the Bristletail (Aiptasia-Eating) Filefish known for the trait. 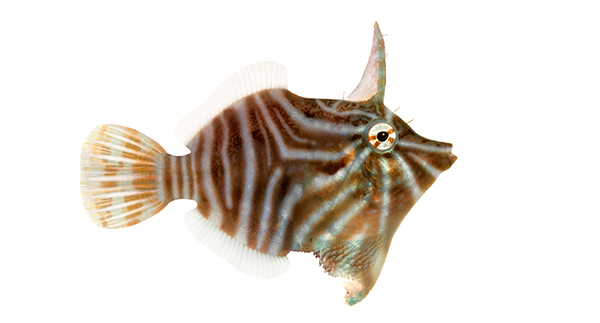 ORA is now shipping young adult Radial Filefish in the 1-1.5-inch (2.5-3.8-cm) size range, and the species is available at retail from local aquarium stores stocking ORA animals, as well as LiveAquaria.com. Fascinating Japanese-made underwater video of several Radial Filefish sheltering in a colony of Xenia coral. Credit: Akira Bingo/Underwater Video JP/YouTube. MASNA 2017-2018 Student Scholarships - Apply Now!